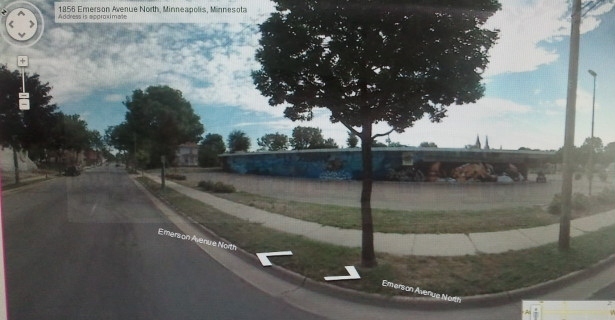 Post by the Hawthorne Hawkman, photo from the MN DOT website. In Mayor Rybak's recent state of the city address that focused primarily on north Minneapolis, he highlighted an amenity that has received much promotion on this blog: Streetcars along the West Broadway corridor. Specifically, Rybak announced city council support for an application for federal funding of a streetcar study. This however, is such a wonkish move that many people either don't know about it, dismiss it out of hand, or believe that streetcars simply won't happen in today's hyper-partisan political environment. And there is a part of me that tries to picture how this might have gone down..."Streetcars are vital to West Broadway's economic development, and I say we need to take IMMEDIATE action! I therefore propose we take a non-binding voice vote in support of applying for funding for a feasibility study, with two other local partners as well, providing they support the application, so that we can then ask the federal government for funding that could potentially allow us to maybe keep on thinking about the issue." On the other end of the spectrum, the Southwest Corridor LRT system is still bogged down in partisan bickering and concerns over a contractor that are actually quite valid. It's easy to be the cynic and say either that the proposed action is so minimal it amounts to very little, or that even steps in the right direction will get stonewalled in today's political and economic climate. I would contend that regardless of the current political landscape, this kind of a study is one of the required steps towards a streetcar line along West Broadway. 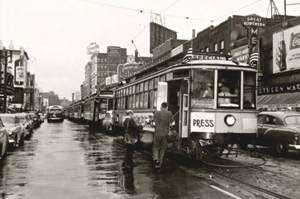 The study would help to demonstrate the economic benefits of streetcars; it would show how they might interact with other forms of transit on the northside such as LRT, BRT, bikes, pedestrians, and cars; and having two local partners in the Met Council and Hennepin County adds credence to the viability of this form of transit. "Modern streetcars build vibrant streets. We need that on West Broadway," said Rybak. Post by the Hawthorne Hawkman. 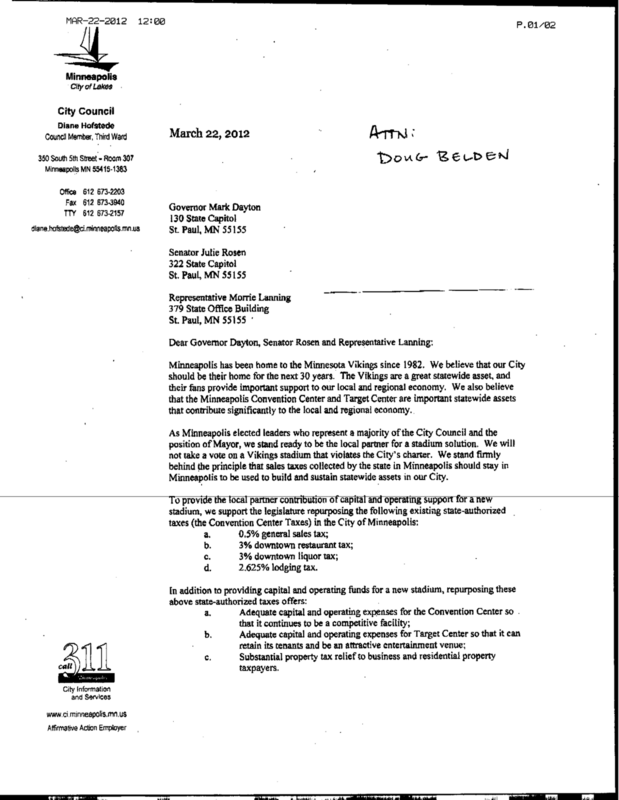 Top document from the city of Minneapolis, bottom image from the Daily Norseman blog. The Vikings Stadium bill is moving along in the state legislature, and morphing too often and too quickly to keep up with on this blog. 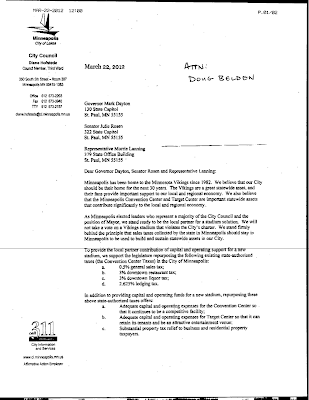 But one key provision that our mayor and seven council members have turned their back on is the fact that the Minneapolis city charter specifically calls for a citywide referendum on any stadium funding greater than $10 million. At the city council meeting that produced a 7-6 vote in favor of the stadium (Rybak calls that strong support), the city's chief financial officer was asked what the total cost to the city of Minneapolis through 2046 would be for this stadium proposal. Now I might not be as smart as these people, so I pulled out my calculator to double-check a few things. And just to be sure I didn't get mixed up with all these newfangled smartphone calculators, I used one that's fifteen years old and only goes up to eight digits. $67,500,000 minus $10,000,000 equals $57,500,000. I know I'm missing a zero in there somewhere, but I'm not too good at math and can't figure out where to put it. Anyway, as best as I can figure, we're allocating far more than ten million in city resources under this proposal, and yet eight of our Minneapolis elected officials are ignoring the referendum requirement. As an aside, the city attorney has issued a verbal opinion, not a written one, and that this is okey-dokey because the state collects these taxes and gives them back to the city or lets us use them or converts them into unique monetary units that only the Vikings faithful can see, or something like that. We don't really know, because this is a VERBAL opinion and not written out. In my opinion, the mayor and city attorney are selling the gang of seven short. I find it extraordinarily flimsy for a $675,000,000 decision to be made on verbal guidance alone. If there were a written opinion, then the support that the seven CM's gave would have more weight at least. So if there's going to be no referendum, what do we do in north Minneapolis? 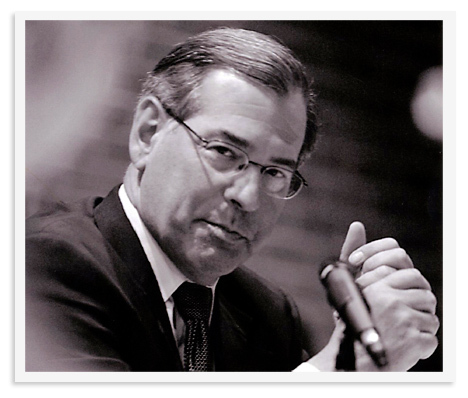 Post by the Hawthorne Hawkman, photo from the Hennepin County Attorney web page. The last time I spoke with Hennepin County Attorney Mike Freeman, I thanked him for his aggressive pursuit of mortgage fraudsters in north Minneapolis. Once a property is touched by fraud, it can be neglected or outright stripped of anything of value, often leading to a condition where it is appealing only to the next unscrupulous investor. That pattern of fraud begetting fraud can cycle for years until a home is ultimately demolished. Freeman's office posted a press release about its successful push to prosecute mortgage fraudsters in the county, many of whom operated within north Minneapolis. 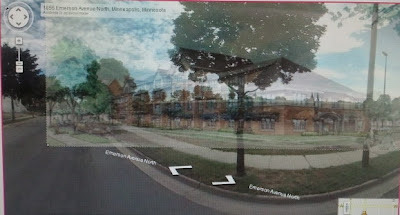 Last year, the Plymouth Church Neighborhood Foundation proposed a 48-unit building on the site of their property at 18th and Emerson. Many neighbors in the immediate area were incensed at the inappropriate size of the development, as was I. To PCNF's credit, they continued to engage the community, adjusted their plans at least slightly, and proposed a Community Benefits Agreement. After a community meeting, the NRRC board supported that CBA by a vote of 9-2. 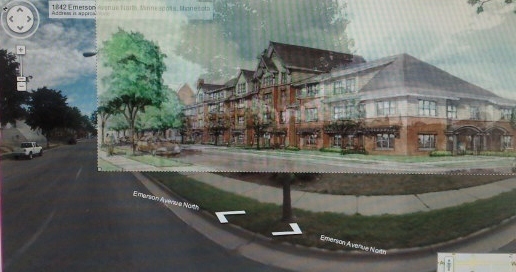 There are still concerns raised over the scope of this project, and whether it fits with the neighborhood as a whole. PCNF did reduce the number of units from 48 down to 41, and agreed to fewer stories on site at the ends of the building, so that it would step down to surrounding properties on the block. I wanted to see how the building would fit though. So with permission from a PCNF staff person, I used their updated site rendering (the one that appeared to have the most support at the meeting) and layered it onto Google Maps. Admittedly, it's hard to get a sense of how the building fits or doesn't fit with these pictures alone, as the maps don't show what's across the street. 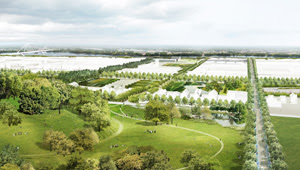 Furthermore, it should go without saying that the site plan as it's layered above may not coincide with the actual location of the structure. But it's about as good of an image as anyone's produced. 30 Days of Biking--Why Do I Have a Car? Fifteen days ago, I came home from a bike ride and hopped on Facebook to post it. 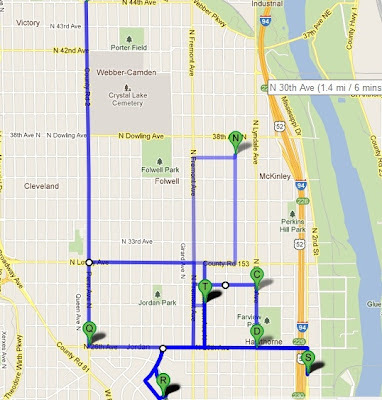 It was then that I came across a challenge on Council Member Lilligren's Facebook page called 30 Days of Biking. Here's how it works: When you sign up, you agree to ride your bike at least once a day, every day, for the thirty days of April. It's a pretty low-key commitment, as the once-per-day biking could just be 30 seconds around the block. In fact, that's precisely what a few of my daily bike trips consisted of because I had to squeeze them in during NHL playoff game commercial breaks. 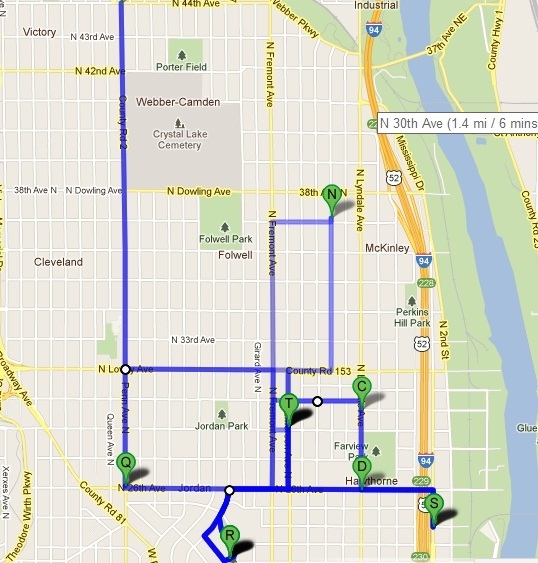 The aggregate map above shows only my first four days of biking. During this challenge, I have tried to use my bicycle as often as possible. It's not too hard when I live, work, worship, and do most of my shopping all within the Near North community. But until this challenge, I did most of those trips by car. And then I'd drive to the gym and get on some cardio machine for half an hour or more in the evenings. This doesn't make a whole lot of sense NOW, but we're creatures of habit, and it didn't take long for 30 Days of Biking to help me kick the habit of the automobile. Post and video by the Hawthorne Hawkman, video from a previous candidate forum, not from the senate district convention. The parliamentary order used to run meetings as small as neighborhood or church council and as large as political conventions has two guiding principles that participants too often forget. First, it's supposed to make sense. Second, people with a superior knowledge of parliamentary procedure are not supposed to use that knowledge to manipulate the outcome of a meeting. Think of David Carradine's character in Kung Fu - a Shaolin monk who was a master of martial arts but never really used that to fight anyone. The meeting or convention that uses parliamentary order might have plenty of drama, but the application of Robert's Rules of Order should have all the excitement of two people exchanging business cards in slow motion after they've taken an Ambien. 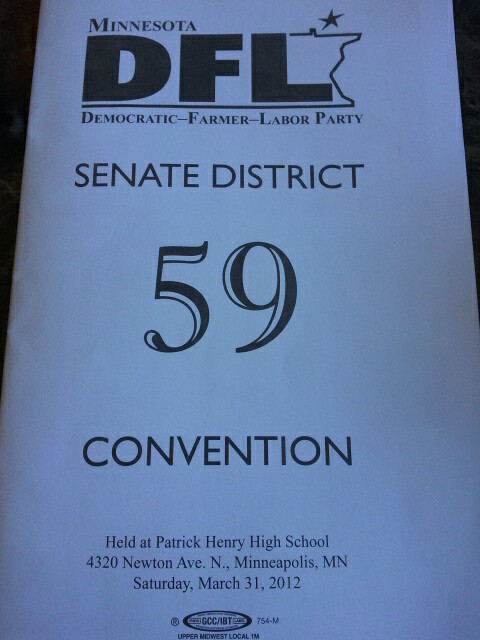 Clearly this is not what happened in the DFL convention for the house seat in 59A. Joe Mullery did get the endorsement, but only after a series of convoluted parliamentary maneuvers. I was in the midst of the 59B stalemate, and only heard snippets of how things were proceeding. Challengers David Younk, David Boyd, and (surprisingly for a sitting elected official) Jon Olson were eliminated from contention after the first ballot, leaving Marcus Harcus to either claim or block a DFL endorsement of the incumbent. In an ironic twist of fate, Mullery was at one time a single vote short of the nomination. Had I already moved into 59A, I would have cast that clinching vote. On two other occasions, there were enough spoiled ballots (the delegate did not sign the back of the ballot as required - even an x, or line, or anything that could remotely be construed as a signature would have validated those votes) that would have given Mullery the endorsement before the drama of the last vote. Post and photo are media releases by the Mississippi Riverfront Design Initiative. Note: These two posts will deal more with the procedures of the convention, as the candidates themselves have plenty of forums to give their viewpoints, and as I hope to make the convention processes more accessible and transparent. If you were to take your junior high experience and put it on steroids, then add a healthy dose of Robert's Rules of Order, throw that in a blender, and consume the concoction for twelve hours straight, that would give you some idea of what a local senate district party convention is like. 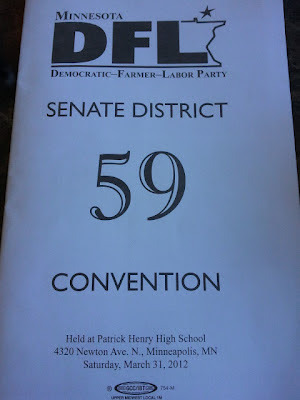 And last Saturday North Minneapolis, Bryn Mawr, and parts of downtown gathered to choose DFL endorsements for our newly numbered Senate district 59. While the endorsement process itself had plenty of drama, the setup for the convention didn't help much either. We were slated to begin at 9:30 a.m. and I arrived about ten minutes early. Even if I missed the first few moments of the convention, this should have been plenty of time to register and find my spot. For the uninitiated, local political conventions require you to know or find out the ward and precinct where you were elected as a delegate, and then find the corresponding table at the registration to sign in. Once registered, you have to find your ward and precinct on the floor of the convention as well. I've been doing this for years, and I often forget how disorienting even the registration can be for newbies. And whoever did the set-up for the event must have thought to themselves, "If there were a zombie attack while everyone was registering, what would be the surest way to make sure the whole convention gets infected?" Zombies, after all, are the epitome of groupthink, and would certainly make the endorsement process faster. (I nominate the candidate who promises the most free brains! All those in favor signify by saying "eeeerrrrrrhhhhhhmmmmm.") Joking aside, the registration tables were set up in a narrow hallway right in front of the main entrance for the auditorium. So we had people entering the school from both sides of the hallway, attempting to get to the registration tables, while other registrants were trying to leave, and while people already registered were trying to come and go from the auditorium. Then when a few people in wheelchairs had to attempt passing through, that somehow added to the gridlock. This had to be the worst placement of registration I have ever seen at a convention--unless the planners were inspired by Leonidas and the Spartans' battle against the Persians. You might think I'm exaggerating here, but the 1:20 mark of the video below contains actual footage of the convention registration process. It took me close to a half an hour just to get registered and up to my seat in the balcony area. Even then we waited a while longer before starting the convention. Why is the registration so important? Because people with kids or pets can't be there all day. Eventually you've got to go home and let them out of the kennel so they can go to the bathroom. (The PETS, just to be entirely clear here.) So the longer the day drags on, the fewer people are still around participating in the endorsement process. We started almost an hour later than scheduled, and that was in large part due to the registration logjam.